How can I get in touch with someone at RecruitiFi? Use our chat for any questions about the platform, payments, terms, etc. Please note: If you have a question about a specific candidate, you can contact the Employer directly through the chat function. Do not reach out to RecruitiFi, as we do not have any information about individual JobCasts or candidates. However, if you have a question about the RecruitiFi platform or anything related to finances (payouts, setting up banking preferences, etc. ), you can contact RecruitiFi through our messaging system. 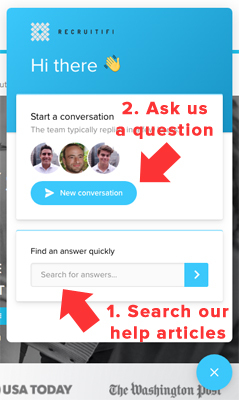 To initiate a conversation, click on the bubble in the the bottom right-hand corner of every page of RecruitiFi (see image below). Clicking on this icon allows you to do several things (see the image below). You can type in a question to search our help articles. We have an extensive library of tips, tutorials, and questions and answers to guid you through the platform. You can also start a conversation with our customer service team, who will review the message and assign it to the person or department who can best answer your question. We strive to provide responses as quickly as possible (usually the same business day), but if you need an immediate answer, please search the help articles first. RecruitiFi does not have a public phone number for customer service. Please use the chat, which allows us to ensure that you're receiving the highest quality answers.